Finally! 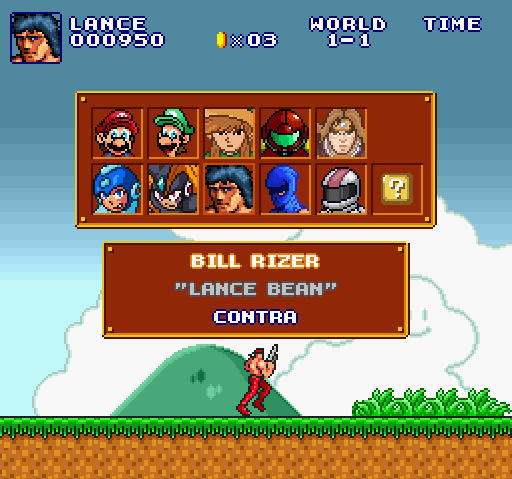 We can play Super Mario Bros. as Lance Bean. Jay Pavlina of Exploding Rabbit has released version 2.0 of his ridiculously awesome Super Mario Bros. Crossover. Since we last visited the game, Jay and crew have added new characters like Ryu Hyabusa and Bass, multiple skins for each character and a bunch of new music. The coolest change, though, has to be the new theme options. You can play any level in the original NES style, or you can switch it to SNES or Game Boy modes. There is even a “mix it up” option that will randomly select different styles for each level, with system-appropriate music to match. The original game is emulated very accurately, and so are the controls for the respective characters. If you’re a fan of the source material, but haven’t tried this yet, you’re in for a treat. I do suggest you follow these instructions and use an actual gamepad. The default keyboard controls aren’t exactly intuitive. As some of you know, I’ve never actually finished SMB proper. So, it’s both cathartic and bittersweet when I blast through this game with a Spread Gun.